Knittin' Kiti gave Knit & Chat members this lovely pattern that goes with the Baby Bonnet. 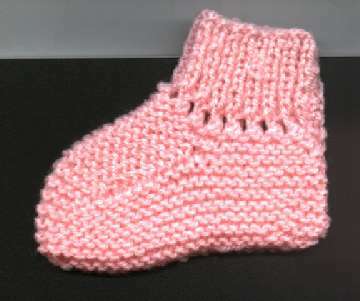 I know you will enjoy knitting this little bootie as much as Mary and I did. Work a K1,P1 rib for 10 rows. Make eyelets as follows, K2tog, *Yo, K2tog* across row. 33sts. Knit 22 sts, turn and knit back 11 sts. Knit 18 more rows on center 11 sts (10 ridges). Cut yarn. Foot: With right side facing, join yarn and knit up 10sts on right side of instep, knit across the 11 sts of instep, pick up and k 10 sts on left side of instep and k across 11 sts on other needle. This will be a bit tight for the first 3 to 4 rows, until you get up a ways on the foot. Knit 9 rows even (5 ridges) 53 sts. Next row: K3, K2tog, K to end. Repeat for another 2 rows. Row 4: Knit 3, K2tog, knit 18 more sts(22sts total). Cut yarn and leave a 12" tail. Using a needle, run the tail through the next 5 sts, then Kitchener st the remaining 44sts together in garter st.
Crochet, braid a chain, or use ribbon, long enough to weave through eyelets and tie in a bow.